A bowl of guilt-free nostalgia for chilly winter evenings. 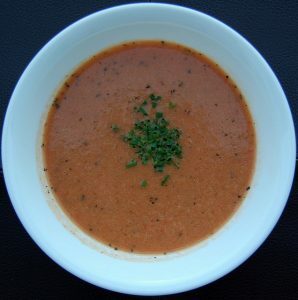 This simple recipe creates a velvety tomato soup that’s good for your body. Tomatoes are nutrient-dense and an excellent source of vitamin C and other antioxidants. With these components, tomatoes help combat the formation of the free radicals known to cause cancer. Tomatoes also contain lycopene, a polyphenol, or plant compound, that has been linked to at least one type of prostate cancer prevention. Delicious spices in this recipe, such as oregano, contain potent antioxidants and have anti-bacterial properties. In fact, a compound found in oregano may actually kill prostate cancer cells. Basil is high in Vitamin D and antioxidants, and research suggests compounds found in this flavorful herb may kill cancer cells outright. To Make Cashew Cream: Soak 1/2 cup of cashews with boiling water for about an hour. Reserve 1/2 cup of the liquid, and drain the rest. Blend cashews with the water until smooth. 1. Heat olive oil in a heavy-bottomed pot, over medium-low heat. When the pot is hot, add onions and cook for 6 to 8 minutes, until the onions are soft. Stir often to keep the onions from burning. 2. Add the entire can of whole tomatoes, including the liquid, and 1 cup of water. Using the back of a wooden spoon, gently smash the tomatoes. Add dried oregano, dried basil, paprika, and a pinch of salt. 3. Raise the heat to medium and bring everything to boil. Let soup simmer for 8 to 10 minutes. Turn off heat. Let the soup cool off for 5 minutes before transferring to a blender to blend. 4. Return soup to pot and stir in coconut milk. 5. Serve in bowls with garnish with your favorite toppings. We love black pepper, basil leaves, and cashew cream. Enjoy!